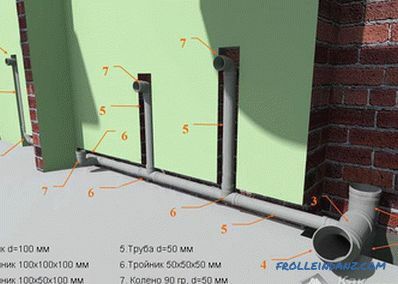 If you are faced with the need to lay sewers and you don’t know how to connect sewer pipes, don’t worry: remember your childhood and play ... in the constructor. 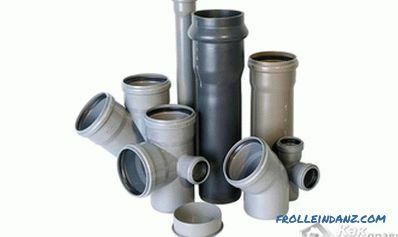 The fact is that modern pipes for this purpose are made of PVC (plastic, in other words). And for the convenience of their installation, they are issued strictly defined diameter and length. Well, since the pipes are not always laid only strictly straight, to them in any store selling such goods, you can find swivel fittings. All this is very similar to the children's designer, as the elements of the sewage system, if you do not particularly delve into the process itself, are simply inserted into each other. 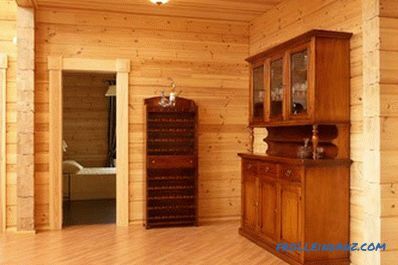 As a result, you get a strong and reliable connection that does not leak, does not let the unpleasant smell and can serve you for a long time without replacement or repair. forms - L-shaped, T-shaped, straight. Do not think that all of the above in the classification fittings are different elements. In fact, the same fitting is in each line of the classification under a different name. Take, for example, a coupling that serves to connect two sewer pipes. By design, this fitting will be just a "coupling", by purpose - intermediate, in shape - straight. 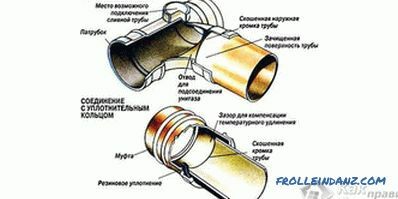 Relying on a similar classification of fittings, it is much easier to imagine what exactly you need to connect the pipes into one design. 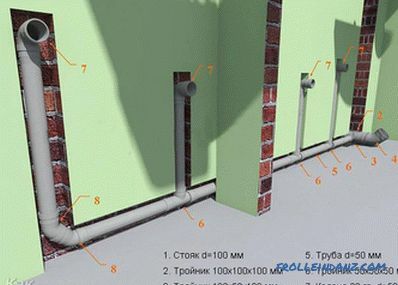 Before understanding how to connect sewer pipes, it is necessary to understand the principle of assembly of all system of the sewerage. So, all the work should start with creating a drawing in which you have to draw your future system. Take a piece of paper and draw on it schematically all plumbing fixtures that need to be connected to the sewage system (sink, toilet, shower or bath, etc.). Then connect them with the main sewage riser . Each line is a pipe. The pipes will be interconnected using fittings. Note that the sewer pipes in the house usually have only two types: with a diameter of 50 and 110 mm. Fifty millimeter ones are designed to drain drains from sinks, sinks, bathtubs and showers, as well as from washing machines and dishwashers. 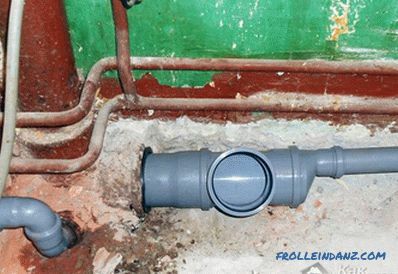 If there are too many plumbing devices on one line, then its diameter should be increased to 110 mm, otherwise you will often have problems with blockages. 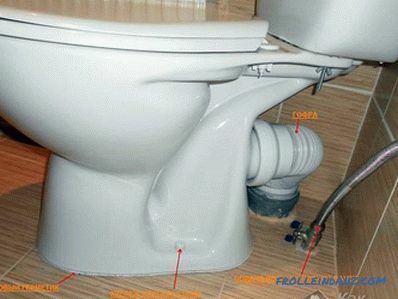 But the toilet is connected only through a pipe with a diameter of 110 mm, while the connection of the sanitary device itself is usually made using a flexible corrugation that is inserted into the sewer pipe. Having understood the elements of your sewer system , you can go to the store. Since it is almost impossible to spoil the sewer pipes when working with them, you should not purchase components with a margin. 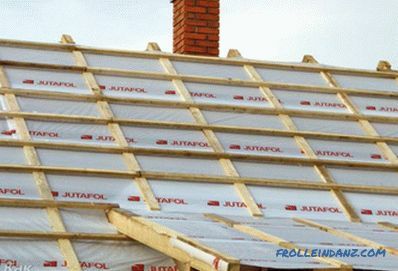 Most importantly, do not forget that each pipe at one end has an extension into which another pipe will be inserted. 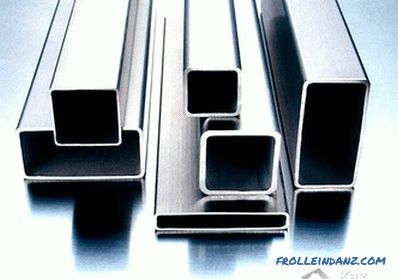 If you cut the long pipe with a hacksaw (the cut must be strictly perpendicular) into two parts, then the second element will not have such an extension, and to connect it to another pipe or fitting you will first need to install the coupling. In this case, the cost of different sets of pipes (one with a coupling or two short) will be approximately the same. The first in the sewer system will be a fitting-turn signal, on the one hand you connect the flexible hose of the sanitary device (siphon) to it, and on the other - the pipe. 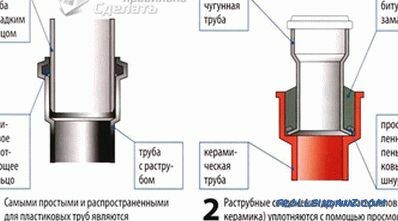 You can, of course, do without this fitting by connecting the siphon directly to the pipe, but in this case, if the joint is not tight, there is a possibility that the joint will leak. the pipe must enter the fitting (or another pipe) for the full possible depth. Next, in places connections to this pipe other plumbing fittings are put tees.If you need to connect pipes of different diameters, use a special fitting adapter. When collecting the sewage system, do not forget about creating the necessary pipe slope, otherwise your system will not provide liquid drainage. It is necessary to move the system from the sanitary devices to the main riser so that the joints do not interfere with the water flow. 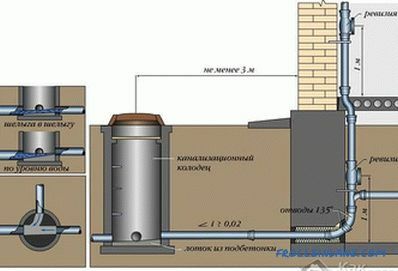 in contrast from the internal or internal apartment, external sewage system (laid along the local area) is assembled without swivel fittings. Instead, it is recommended to arrange wells - they will facilitate cleaning. 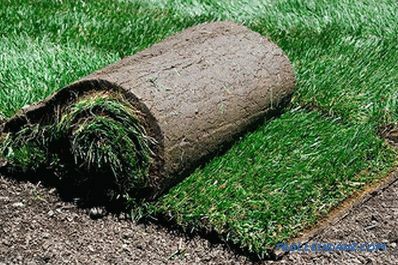 After all, all the pipes will be hidden in the ground and it is quite difficult to dig them out every time they become clogged with you, and cleaning through fittings that go to the surface of the ground is not always possible. Of course, outdoor sewer pipes have a larger diameter than pipes in a house. Each of them, cutting into the outer tube, increases its diameter by one size. If the external pipe is common for the other two with a diameter of 110 mm, then its diameter should not be less than 160 mm; for three pipes of 110 mm each - with a diameter of at least 200 mm. This rule applies to small buildings, provided that the distance to the nearest sewer does not exceed 30-40 meters. In other cases, the outer tube must have a larger diameter in order to work "with a margin."